Humboldt Green Week is a celebration of the confluence of two of our favorite holidays: Earth Day, and the Cannabis Holiday 420. Doing good for the environment can be fun, and Humboldt Green Week helps us take a moment to enjoy what has already been accomplished, shake loose from our day to day distractions, and get out and share space with the community that we are all working to help build. Deep Groove Society, Fraktal Production, and Humboldt Green Week come together to bring you a very special Sundaze and pre-party for the start of Humboldt Greek Week. Come join us on April 9th when we welcome two special guest, Open Bar Music and Dance Gruv Radio recording artist Blackliquid (UK) and Los Angeles based Superfreq label artist Jonra. Curating this special night is DGS founder and Wulfpack Records label artist Jsun alongside crew mate and Fraktal Production founder, Marjo Lak. We hope to see you all there!! PastaLuego is introducing Gelato to Humboldt. This is the real stuff and Coco is having Gelato and Sorbet shipped in from Sacramento. We are so excited to bring this extra Italian element to our shop and share with our Humboldt family. soundcloud.com/soohan“Soohan takes us on a multi-faceted journey across the globe, pulling from the traditional music of various cultures and from the depths of our nostalgia. His unique sound sets him apart from many popular bass music acts, and has earned him a cult following across the US. Garnering streams in the hundreds of thousands and a slew of festival appearances over the last few years, SOOHAN has quickly established himself as a foremost presence in global bass + electronic music scenes.His style is a signature blend of outlandish trap-influenced production, dashed against the backdrop of regional folk music selections that span the entire globe. “Lindsey’s love for Future RnB, Hip Hop, and deep bass music has led her to delve into the creative world of live mixing. Bringing chill mid tempo bass music to the floor in eclectic patterns to instill hip hop nostalgia alongside psychedelic inspirations. In the Summer Lindsey can be found behind the scenes in the Northern CA music festival industry, where she works as Hospitality coordinator for Northern Nights Music Festival and Art Gallery Manager at Enchanted Forest and Lucidity. She is creating a special mix to share with our guests to set the vibes right. “Jason Burruss creates thematic auditory experiences that are carefully curated to the time, setting, and atmosphere of the venue. Healing bass tones, ethnic grooves, and futuristic vocals and synths are often layered into his palette of live music mixes. Dreams are created. Through these layered and sampled textures of music the vibration of all music and the separations of genre are healed. HGW Presents: Get Up! Clean Up! Join NHS, CPP and the Pac Out Green Team as we partner to clean up the Sequoia Park area of Eureka! This event is sponsored by Humboldt Green Week Northcoast Horticulture Supply and Community Pride & Peace (formerly Community PRIDE Project). 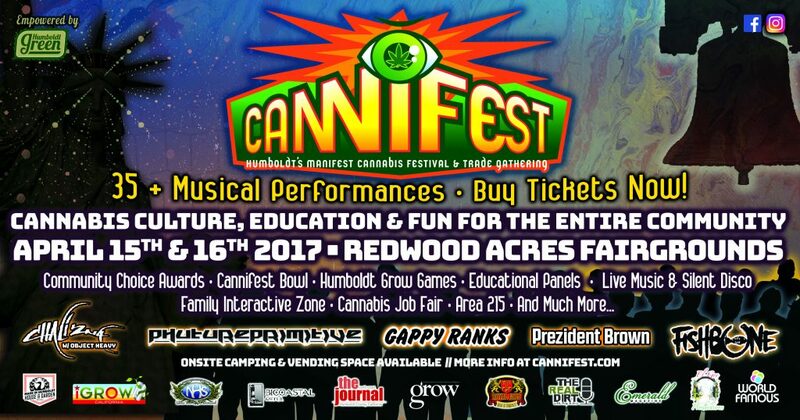 We are stoked to be working together with these good folks at what will be our first event at Sequoia Park in Eureka! We will meet at the parking area located on Madrone Ave. at 8:45 am to sign in, start the cleanup at 9 am, then back up at 9:50 am for a quick group photo and raffle. We finish at 10 am and are ready to enjoy the rest of the weekend! Hope to see you there! The North Coast Growers’ Association invites the community to our five certified farmers’ markets to celebrate the bounty of fresh and local Humboldt grown produce and GMO-free foods. Join us in supporting local farmers, the local economy and healthy families. 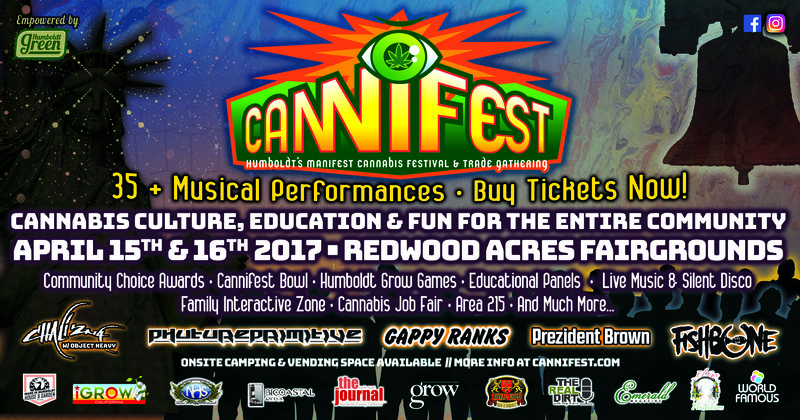 This day features the 2nd Annual Cannabis Job Fair and four stages of panelists speaking about cannabis related topics. Walking tour of the the Fire and Light glass facility. See how the glass is made, learn the history of this wonderful local business with it’s world wide reach, and enjoy light refreshments. Humboldt’s Om values the importance of building community through creating intentional space for non-linear thinking and healing to occur. All those in search of healing and aligning the body, mind and spirit through the integration of these practices are welcome. HGW and Richard’s Goat Tavern Present “SEED: The Untold Story” at the Miniplex 6:30pm. Special Green Week cocktail available all week featuring Humboldt Distillery’s organic hemp-infused vodka. Northtown Coffee presents, Humboldt Green Week Earth Poetry Night 6-8pm. Come grab some sweet green week treats and listen to your community poets. The Banff Mountain Film and Book Festival takes place each fall in Banff, Alberta. It is nine epic days of mountain stories that includes profound journeys, unexpected adventures, and ground-breaking expeditions told by authors, photographers, and filmmakers from around the globe. Following the Festival, the World Tour hits the road bringing audience favourites and special tour edits to a location near you. HGW and Richard’s Goat Tavern present the Seventh Generation Fund Wake Up The World Tour, featuring musical performances and speaking engagements by a group of dedicated water protectors. Savage Henry Magazine’s Annual Comedy Tour Kicks off for 2017 with the Get In The Van Tour! $7 helps us get on down the road! Come support the Mattole Restoration Council with a perfect trifecta of bird calls and trivia, fantastic blues to swing music, and delicious Mad River beer! In addition to a great time, $1 from each pint goes to support local, environmental restoration work in the Mattole. At the Mad River Brewing Company in Blue Lake – Wednesday, April 19th from 5-9pm. HGW and Libation presents: Green Week Wine Flight. Today and tomorrow. Come celebrate Earth Day with a Organic/Biodynamic Wine Flight. Carefully selected wines to showcase the beauty of wines that are created with Mother Earth in mind. HGW and Northtown Coffee present: Humboldt Green Week Open Mic 6pm-10pm featuring the Green Week Coconut Matcha and music to celebrate our community and the planet. BIIIIGG!! LIGHT UP THE NIGHT!! GREEN WEEK CELEBRATION 2017!! WE ARE BACK Friday APR 21ST! Jah Sun with Live band and CBaker w/ Dynasty One will be blazing the stage performing alot of new album music and doing cd giveaways!! Mark D Calendars and Wake D Town APR 21ST its going DOWN! Support your local musicians and community gonna be good times! See you there! $15 limited advanced/$20 advanced tickets at World Famous Productions. Presented by Humboldt Green, Whomp, and World Famous Productions. “This show is something i’ve been working on for a while now. To mark the release of my first full length concept album, ‘Totality’ myself with the visual mastery of Johnny Dumps have created a projection mapped stage that incorporates my love of science fiction films and electronic dance music. Standing at the galactic crossroads of connectivity and combustion is melodic music manipulator Miles Ross, aka Psy Fi. His soulful, bass heavy yet playful rhythms spark a beautiful resonance in the ear and a swagger in the hips of the beholder. His music celebrates boundless splendor that pulls you through the looking glass into another place. Psy Fi has played for audiences spanning the globe from Croatia to Costa Rica and has materialized in front of thousands at Envision Festival, Symbiosis, Burning Man, Lost Theory, Northern Nights and more. Psy Fi regularly tours and has hit the road with fellow dynamos Mr Bill, Dubvirus, Pymbionic and Hypha. He’s also released music on Muti Music, MalLabel Music, Gravitas Recordings, Ooze System Recordings, Loony Moons Experiment and more. He has received support from the likes of Minesota, RUN DMT, Liquid Stranger, Perkulat0r, Truth, and Stephan Jacobs to name a few. ~ Official. March for Science on Earth day in Humboldt. From 9 am to 1:30 pm, the Science Expo will be open to the public in the D Street Neighborhood Center. Community members will be able to learn about science-based programs and issues, such as Klamath River dam removal, climate change implications to Humboldt Bay, college and high school science clubs, water and air quality, and health care. Coffee, tea, and light breakfast fare will be available. At 2 pm, there will be a rally featuring diverse speakers from our community, including scientists, teachers, students, politicians, and Tribal members. The stage will be in the D Street cul-de-sac. Seating will be available near the stage for the elderly and community members with special needs. The march through Arcata will begin somewhere between 2:45 and 3:00 pm. While the exact route has yet to be determined, it will be about 20 blocks long and include the Plaza area. Following the march, break-out sessions for small group discussion (ie, “what do we do next”) will occur in the D Street Neighborhood Center between 4:00 and 5:00 pm. We encourage participation by community members of all ages and are looking forward to seeing lots of creative signs, hats and costumes. We will be filming the event and are encouraging rally and march signs that include science-based poster session material. Our March Marshals will be awarding random prizes for creative and unique posters and signs. There will be face-painting by Butterfly Body Art available for kids (of all ages) during the science expo and a couple of food trucks parked onsite. Please note: The Humboldt March for Science is a drug and alcohol free event. Please leave your furry friends at home, and do not bring glass containers. Limited parking will be available on the Humboldt State University campus, just north of the D Street Neighborhood Center. We strongly recommend carpooling, busing, walking, or biking to the event. The Humboldt March for Science is an educational, peaceful, non-violent, inclusive event encouraging solidarity, involvement, and interaction from a diverse community of thinkers who hold Science to be valuable in this complex, inter-connected world. The Humboldt March for Science recognizes the role of science as a means by which all people can seek a deeper knowledge and understanding of our world. We come together in unity as a community to advocate for sound public policy, access to science for everyone, and the protection of our planet. HGW, The Co-op and Zero Waste Humboldt Present: an in store event celebrating Earth Day! Arcata and Eureka Co-op locations from 10am – 2pm. At Fieldbrook, contact Flyin’ Lynx for more info on time or location. Area 74 Fieldbrook, Saturday, April 22 at Area 74, Registration 10am. 11:11am start! One day event to raise money for the disc golf development fund at Humboldt Area Foundation. The event issponsored by Northcoast Horticulture Supply and Humboldt Green Week. Sequoia Humane Society will be there and they will bring some adoptable dogs! Also, Six Rivers will donate a portion of the profits from tonight’s beer sales to the Sequoia Humane Society.